For countless decades there have been so many uncertainties in our world and in recent years, society as a whole has done quite the job at instilling fear into almost every aspect of life. In some ways fear has taken over common sense and this is unhealthy. Whatever happened to the incredibly powerful motto, “Be Prepared”, which was once entrenched into not only hundreds of thousands of children over the decades in Boy Scouts and Girl Guides but in adults as well? The most recent fear that has enveloped so many people is the possibility of another global conflict. In reality this is an ongoing fear that has plagued us for decades. During the 70’s Bruce and Jean Beach were not going to sit idly by while tensions between the U.S. and Russia increased. They thought nuclear war or some other global catastrophe could happen in their lifetime and they wanted to make sure that should something horrific happen, people, especially children would have a safe place to turn to. In 1980 the first four of 42 school buses were strategically put into place and in 1985 the last buses were buried. 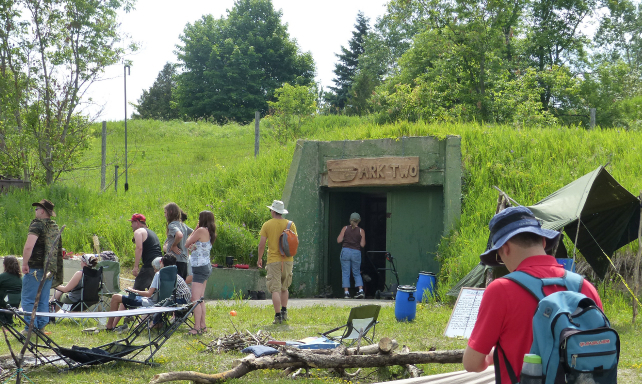 Over the years Bruce, Jean, and their family worked on creating a magnificent underground shelter. Bruce is an exceedingly humble man and when I spoke with him last year he said, “I could have been out there playing golf with my colleagues but instead I wanted to do something constructive, something that could ultimately help mankind.” The support and love his family gave Bruce to help fulfill his vision is second-to-none. He wasn’t living in fear, he was empowered and felt great that he was in a position to help people should a need arise. Thankfully he had so much love and support because needed he need it over the years due to bureaucracy. Bruce has been in court a plethora of times fighting for what he believed in. Bruce and his family had many years of conflict as every level of government did what they could to try and stop them from constructing and stocking this shelter. In fact, one approach that was taken by local government was to raise his property taxes by 10,000 percent. Bruce says that is no lie; they raised his taxes to a level they were hoping he could not maintain the property. It took a few years of pushing back but eventually the taxes were cut in half. I’ve had the pleasure of knowing Bruce and his family now for about four years and there is not a doubt that their efforts to be prepared, and their love for others by far exceeds any other family I know. They know no fear and empowered themselves to conquer the odds. So how does all this tie in with wild edible plants? Of course being prepared for a catastrophic event is not what we want to think about as it is rather grim; however it is really important to come to the acceptance there are many things out of our control. Empower yourself with what you do have control over and that is being prepared. There’s an old saying that goes “it’s better to have and not need than to need and not have”. Learn what wild plants, trees, berries, and easy-to-recognize fungi are edible. Have books on hand because cellular technology along with the power can go down. Apps aren’t going to help you. Having knowledge is by far the best skill to have. In addition to foraging for wild plants there‘s always foraging for edible insects as a source of food. I can’t say I’ve eaten many insects but I do know that the goldenrod gall has a rather pleasant taste. Eating insects may sound disgusting to many, and for some this is part of their cultural cuisine, but to a person who is in need of food, insects will be welcomed. Some people ask what will happen if a nuclear bomb is dropped? This isn’t an easy question to answer as there are so many “if” factors that come into the equation. If you are at ground zero then there won’t be anything living for a very long time. If you are interested in knowing more about the “if” factors a pdf book will be available about this topic on EdibleWildFood.com’s store page by mid-December. It never hurts to get online and learn a few survival skills in the event of any unexpected trouble. Getting lost on a hike, earthquakes, or storms taking down the grid for a few days are a couple of good reasons why having knowledge and not needing is better than needing and not having. For more information on the Arc II click here. What an amazing post and thanks! So much information and are you for sure we can eat insects? That sounds totally gross but I guess if I had to I would? Thanks for all you do! Could you recommend a short list of books for plant identification, wild food including insect prep, etc? Research Pascal Bauder – he has several books out and between him and his wife Mia they are amazing with wild food recipes as well as using insects! Check out Lone Pine Publishing for identification books – they are in my opinion the best there is out there. They have different books for different geographical regions.